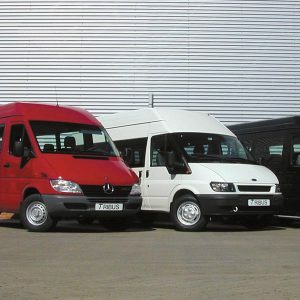 Tribus built the first minibuses that meet the new M1 EU Directive 74/408, 76/115, 77/541, 78/932. 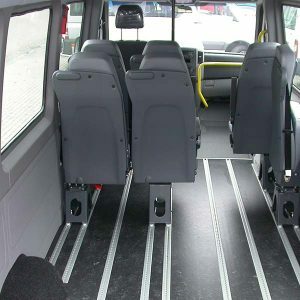 These minibuses were equipped with stainless steel tracks for fitting seats and wheelchairs. 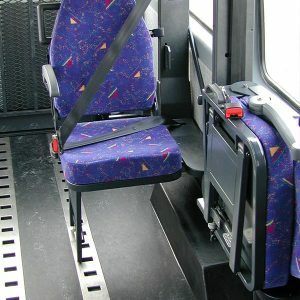 Crash tested, seats with three-point belts. 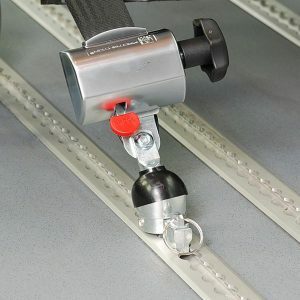 This new wheelchair retraint system has four retractors that tighten themselves vwhen the release button is pressed or by turning the hand wheel. 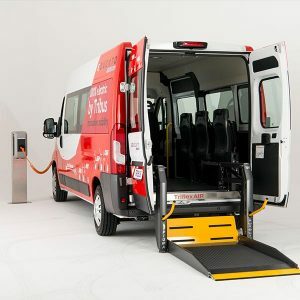 This facility saves a considerable amount of time when a wheelchair is being secured and makes it possible to avoid inappropriate working positions during the process itself. Tribus was the first company who introduced the M1 folding seat in the Netherlands. Flexible, foldable seats with the highest ergonomics and comfort. 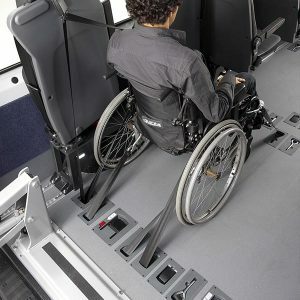 Tribus developed a multifunctional aluminum M1 floor consisting of several airline rails to create a flexible layout for seating and wheelchairs, the Triflexfloor. The floor is connected to the body by means of an adhesive bond a few bolts at the back. This on-piece reinforced polyester solution was miles ahead of the competition in terms of inproved acces, reliability and durability. No welding, secured through an adhesive bond and bolts. 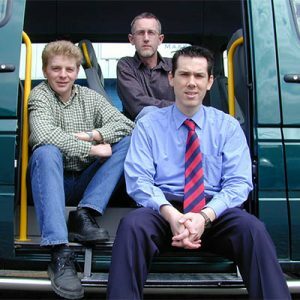 We developed a brand new chassis for minibuses. A new concept that has no steps to the entrance. 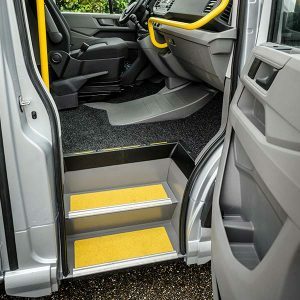 Being low floor improves the accessibility of the bus for the public, particularly the elderly and those in wheelchairs. Tribus continues to innovate with the development of TriflexPLUS®. 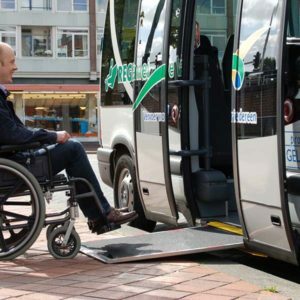 A new patented wheelchair retraint system in which the tensioning belts are integrated in the floor. This self tensioning belt is operated mechanically by means of a central lever in the floor. Nothing could be easier. Tribus is growing due to their new innovations. The innovations are approved by M1 European Type Approval. Tribus expands her horizon by exporting products to 18 different countries. 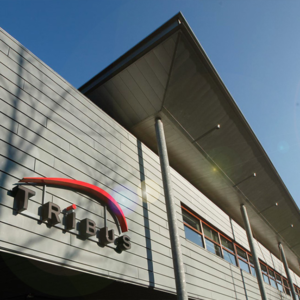 A bigger location is needed and Tribus moves to a new businesspark in Utrecht, near highway A2. The Civitas is the first series low-floor minbuses especially developed for public transport providers. The Civitas based on the Fiat Ducato is suitable for 20 passengers: 10 seating and 10 standing. 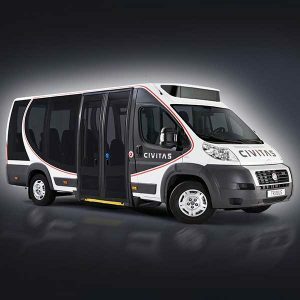 This Civitas can carry up to 20 passengers, and there is accommodation for a wheelchair user. Tribus unites past and new innovations in the new integrated floor- and seating system TriflexAIR. With high-end materials we created a light weight system that saves fuel and spares the environment. The system is succesfully tested by European safety standards M1. We created a new design for the TriflexAIR seat. 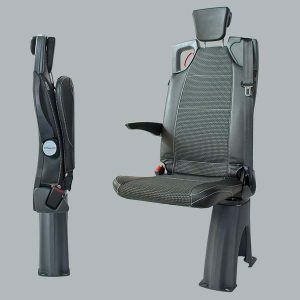 The seat has become lighter, stronger and ergonomic. A top quality design for intensive use. This electronic secure system takes not only care of a secure check of the wheelchair restraints, but also of the seat belts. This electronic secure system warns the driver in case of incorrect use. The organization is thriving and reaches another milestone by becoming a Certified ISO 9001 partner. Tribus is focused on meeting customer expectations and delivering customer satisfaction. New innovations are wel received by the market and export grows steadily. Our high quality vehicle modifications and good aftersales process results in a partnership with Mercedes-Benz. Tribus becomes an official Mercedes Van Partner. The partnership also benifts our customers, as they can relay on a goodpurchasing process that is subject to strict quality requirements. 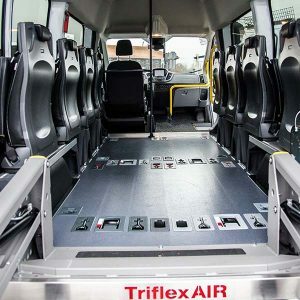 Tribus keeps innovating and introduces three types of 100% electric minibuses with fully integrated TriflexAIR seat and flooring system. Rewarded with the 2017 Dutch Taxi Innovation Award!